There are plenty of opportunities to fit in fitness and make it fun no matter where you are! Whatever your destination, a vacation provides plenty of opportunities for fitness. The key? 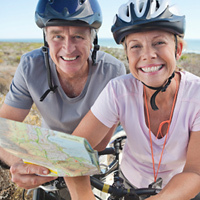 Fit physical activity into your plans — and make it fun! Consider a vacation centered on an activity such as hiking, biking, rafting, backpacking, golfing, yoga or swimming at a beach. Choose lodgings that offer a pool, fitness facility, spa or guided activities. When making reservations, ask about activities appropriate for your family. Inquire about nearby walking or running paths. Pack a pair of comfortable walking shoes, a bathing suit and sunscreen. If you're renting equipment, make sure it's well maintained and meets safety standards. If you rent a bicycle or in-line skates, include a helmet and pads. Wear the right clothes. Dress in layers if necessary. Explore the sights by walking, biking or hiking. Try something fun you've never done— such as snorkeling, water skiing or kayaking. Walk to restaurants, shops and attractions. Go out dancing in the evening. On a road trip, take breaks for short walks, a game of catch or stretching. At airports, walk the terminal. Try camping, and carry your gear. If the weather's bad, consider indoor activities, such as in-line skating or walking through a museum. End the day with a dip in the hotel pool. Be sure to introduce children to new activities gently, and build in time for naps for younger ones.